Native Texas Glenn W. Michalk was admitted and licensed as an attorney and counselor at law in all the courts in Texas by the Supreme Court of Texas on May 18, 1970. 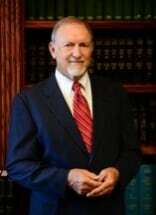 He received his Doctorate of Jurisprudence from the University of Houston College of Law in 1970 and a bachelor's in psychology from the University of Houston in 1966. Before private practice, Glen served as the city attorney for Killeen and assistant district attorney for Bell County District Attorney's Office. He is a member of the State Bar of Texas and currently assists the firm as Of Counsel on matters relating to personal injury, real estate, probate and business matters.